● An office mouse scurried through the ceilings of Evil Robot Corp and spotted an unlocked computer. She shared this Google Sheet with us before she had to flee. Can you decipher it? I put off doing this one because reverse engineering Excel formulae sounded like a nightmare, but it ended up being totally fun. Also I’m pretty sure I solved it in an insane way – it sounds like the challenge creator(s?) intended this challenge to be solved by hand. 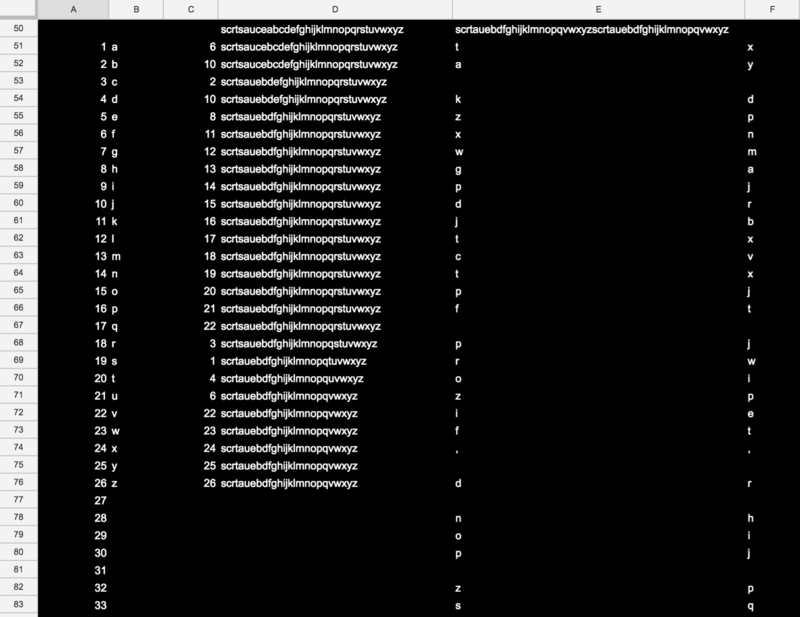 A is the (1-indexed) index of ciphertext characters. B is each letter in the alphabet, non-repeating. C is =FIND(B51,D50): the index (1-indexed) of the current row’s cell in column B within the previous row’s cell in column D.
D is =CONCAT(LEFT(D50,C51), SUBSTITUTE(MID(D50,C51+1, LEN(D50)), B51, "")): a mildly annoying to parse formula that forms the state generation function of the key derivation algorithm. E and F are, respectively, the ciphertext and plaintext split into individuals chars. D50’s formula is =CONCAT(LEFT(REGEXREPLACE(LOWER(B4), "[^a-z]", ""), 10), "abcdefghijklmnopqrstuvwxyz"): The input key (cell B4), with all alpha chars made lowercase and all non-alpha characters removed, cut to the 10 left-most characters, then with the entire alphabet concatenated. E50’s formula is D76 (the final state of key derivation) concatenated with itself (duplicated). E50 is the actual key used in encryption. to update the state, we need to generate d_left and d_right. with all occurrences of b deleted. to encrypt, we operate char by char. in the master key, add 20 to that index, and call it findval. That’s all pretty stream-of-consciousness from the midst of flow, so it might be easier to look at the Python in my solution, or to just stare at the Excel formulae yourself. Using that understanding of key derivation and encryption, I implemented both in Python so I could write a script to search the keyspace for me. The search would involve checking whether a given key decrypts the ciphertext successfully. It was easy to figure out the target plaintext: passing the ciphertext through quipqiup (mostly) solves it – it’s the first sentence of the Recursive Set Wikipedia article. ta kzxwgpdjtctpf prozif, d nop zs adpgidc agxjoin tn kdccom iokgintho, kzxwgpdjco zi moktmdjco ts proio tn da dcyzitprx ertkr poixtadpon dspoi d statpo dxzgap zs ptxo (ertkr xdf mowoam za pro ythoa agxjoi) dam kziiokpcf moktmon eroproi d ythoa agxjoi joczayn pz pro nop. In computability theory, a set of natural numbers is called recursive, computable or decidable if there is an algorithm which terminates after a finite amount of time (which may depend on the given number) and correctly decides whether a given number belongs to the set. 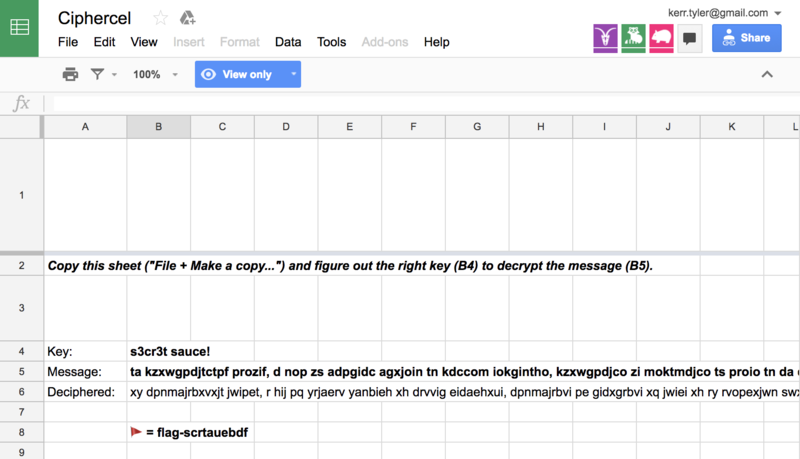 Since it seems that the key/message space isn’t 1:1 (that is, a given decrypt can be achieved with multiple different keys), I thought I’d first try a bit of exhaustive search. The key is truncated to 10 chars max, and 2610 is a bit too big (roughly 248) for a full exhaustive search, but I looped through one through four chars in an hour or so with no luck. At this point I was pretty sure that some manual differential cryptanalysis is the intended solution, but I didn’t have any great ideas about how to go about this, and just messing around by hand wasn’t getting me very far. I think the best I could do was getting “in co” as the first four chars of plaintext before I gave up on that approach. I added some rudimentary progress-bar style score visualizing. Here’s what it looks like! I don’t really get most of this stuff but from some Wikipedia skimming it seems like Simulated Annealing is closer to what I’m actually doing. Anyway, I parallelized this by running the script on as many cores as I had quick access to, and found the key (and flag) within about 15 minutes. Using PyPy gave me a speedup of roughly 3x, by the way, with no additional effort required! I feel a little guilty for solving this in a ridiculous way, but I mostly just had a lot of fun. I definitely didn’t expect my method to work so I was very excited when it did.